Though it may look like a deer, though it may move like a deer and though it may even smell like a deer... it still might just be a robotic deer that officials use to catch illegal deer hunters. Like the robot deer above, who totally looks like a normal deer but actually got a hunter who shot the robot in the neck arrested. 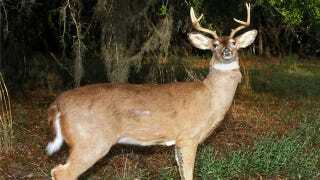 The Florida man had apparently seen the deer on the side of the road (placed there by the police) and shot it with his rifle. That's illegal because deer season is currently closed and because you can't shoot a deer from a roadway. According to the Miami Herald and Outside Magazine, the Florida Fish and Wildlife Commission have been using robotic deers like this to catch hunters for a while now. They place it on the side of the road, control its movements and have officers pop out of nowhere after the shot is fire. Apparently it works!